As soon as the calendar hits Dec. 1, you can find me curled up in a blanket burrito, fuzzy socks on, hot chocolate in hand and classic Christmas movies on the TV. I’m never happier than I am in December. Something about all the festivities and spirit going on around me is heartwarming. Since I was little, Christmas movie marathons are a must for me and my family. 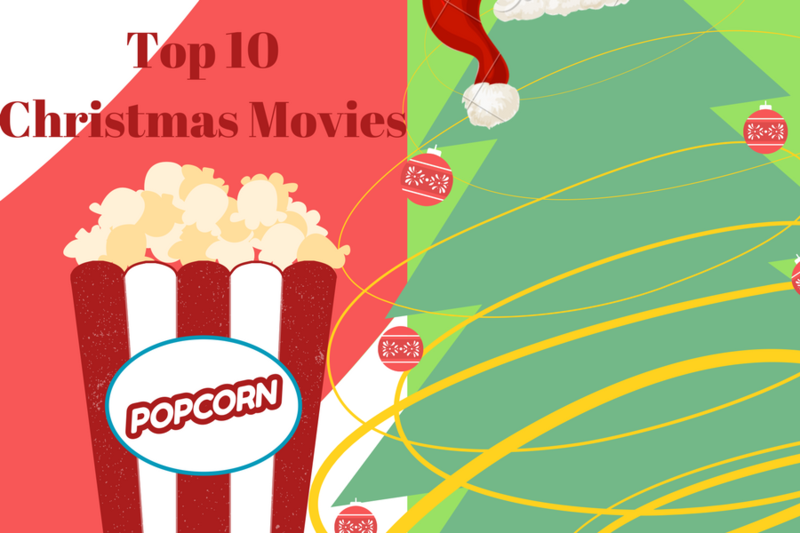 Here are my top 10 movie recommendations to keep you happy and cozy during the holidays. Elf: When Buddy the Elf figures out that he’s truly not an elf, he starts his quest to New York to find his dad. From eating cotton balls to drinking syrup, Buddy’s father finds it hard to really connect with his new found son. Elf is an annual Christmas tradition for me and my family and it is personally my favorite Christmas movie of all time. This is a classic and hilarious family Christmas movie. Polar Express: When a skeptical boy suddenly wakes up on Christmas Eve with the Polar Express waiting outside for him, he is taken on a crazy adventure. From meeting new friends, elves and Santa, the boy’s view on Christmas will be forever changed. The Polar Express is definitely a close tie with Elf for me. Both are funny and cute movies. How the Grinch Stole Christmas: Since he was a young boy, the Grinch has lived alone on a mountain top, hating Christmas and everyone in Whoville. When six-year-old Cindy Lou is introduced into his life, he is set on a journey that will make his tiny heart grow. The Santa Clause series: When divorced dad Scott Calvin accidentally causes Santa’s death on a snowy Christmas Eve, the responsibility is quickly put in his hands. With this new responsibility, Scott Calvin becomes the new Santa Claus and goes through many challenges to make the holidays magical again. A Christmas Story: Based in the 1940s, all young Ralphie wanted for Christmas was a Red Ryder beebee gun. When Christmas day comes along, Ralphie is disappointed with his presents until he discovers his hidden one, the Red Ryder beebee gun. Throughout the movie, now adult Ralphie narrates the day he received his favorite gift. Home Alone Eight-year-old Kevin Mccallister is the youngest of five and always gets tormented by his older siblings. When he wishes for no family, he wakes up the next morning to find himself completely alone. After freaking out, he realizes that the rest of his family accidentally left him and are now en route to France for Christmas. Scrambling back to the US, the whole family is met with many obstacles. This series is a compilation of Kevin’s booby traps to fight off thieves, crazy adventures, and more. National Lampoon’s Christmas Vacation: Clark Griswold and his family venture out to the country to cut down their own Christmas tree when it suddenly takes a drastic turn. From having to pull out your own tree, causing an explosion, kidnapping and more, this family’s Christmas is definitely an adventure. Christmas with the Kranks: With their daughter going to Peru, and no Christmas plans, Luther and Nora Frank plan a trip for a Caribbean cruise. All packed up on Christmas Eve, their daughter, Blaire, calls and tells them she and her new husband are surprising them for Christmas. With 12 hours to spare, the family gets help from their neighbors to throw their annual Christmas party before Blaire shows. A Charlie Brown Christmas: Despite all the Christmas festivities, Charlie Brown still finds himself depressed. When Lucy recommends that Charlie should direct a play, he accepts but ends up running off feeling like a disappointment. When all his friends show up and cheer him up, Charlie joins in and becomes happy. Disney’s A Christmas Carol: Set in 1843, Ebenezer Scrooge is alone and miserable on Christmas Eve. When Scrooge is visited by the ghost of his old business partner, he is warned that three Christmas spirits will visit him to guide him out of his misery. The Scrooge is then visited by the ghost of Christmas past, the ghost of Christmas present and the ghost of Christmas yet to come. After the visits, his perspective on everything greatly changes. He then wakes up on Christmas morning with a full and happy heart.